If you want to hide some of the apps that come pre-installed with iOS — such as Stocks, Weather, or Game Center — there’s a nifty new trick that’ll allow you to place them into the Newsstand folder. No jailbreak is required — you don’t even need a computer — and you can hide as many apps as you like. You can also open them as you normally would from inside the Newsstand folder. Here’s how the trick works. 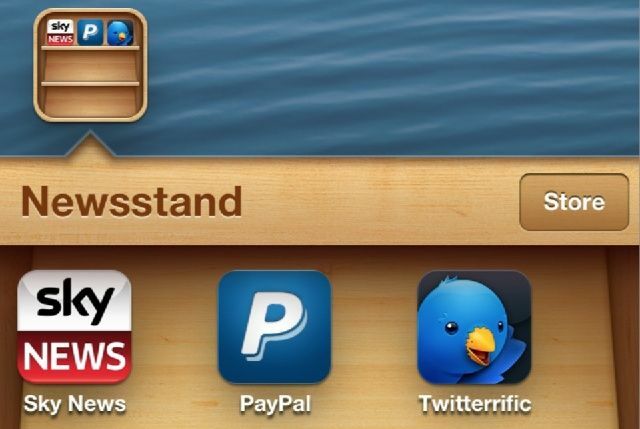 Place the Newsstand folder on the second page of your home screen. Place all the apps you’d like to hide inside Newsstand on the third page of your home screen. With your iPhone on that third page, press the home button once, and immediately tap and hold on the first app you’d like to hide. With your iPhone back at the first home screen, release your finger and swipe over to the second screen. If the trick worked, your icons should be wiggling. Open up the Newsstand folder and tap the home button again. The app you wanted to hide should now be placed inside Newsstand. It may take a little practice, but it’s easy once you’ve got it. If it didn’t work, you may have been a little too slow. With step four in particular, you have to be fairly quick, or the trick doesn’t work. iDB has put together a handy little tutorial video that may be easier to follow. There is one caveat to this trick: if you restart your iPhone or it shuts down automatically when your battery dies, all of the icons you placed inside of Newsstand will be back on your home screen. That means you’ll have to perform all these steps again to hide your apps again. What’s more, you can’t remove apps from the folder individually; the only way to take them back out is by restarting your iPhone.